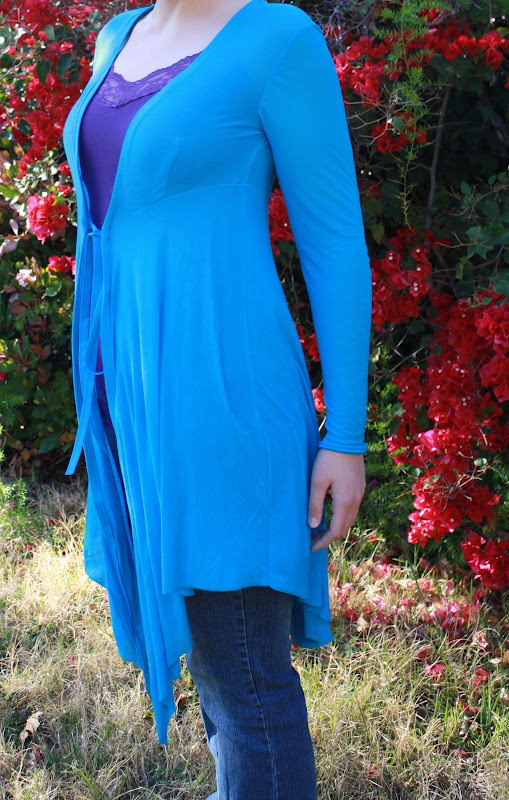 The second item completed in my bout of spontaneous sewing is style 122 from the March Burda. This was one of the patterns I liked right away, and it grew on me the longer I looked at it in the magazine. Even better, the top uses the same pieces as shirt 121, which I also wanted to make. I have had this thin blue knit in my stash for quite a while, and I was trying to save it for the perfect project. I got it before I cared about fiber content, but it was so bright and soft, and happy, and soft, and lovely and soft that I bought 2 yards and didn’t look back. It is, however, a bit thin, so I didn’t use it for a top right away. 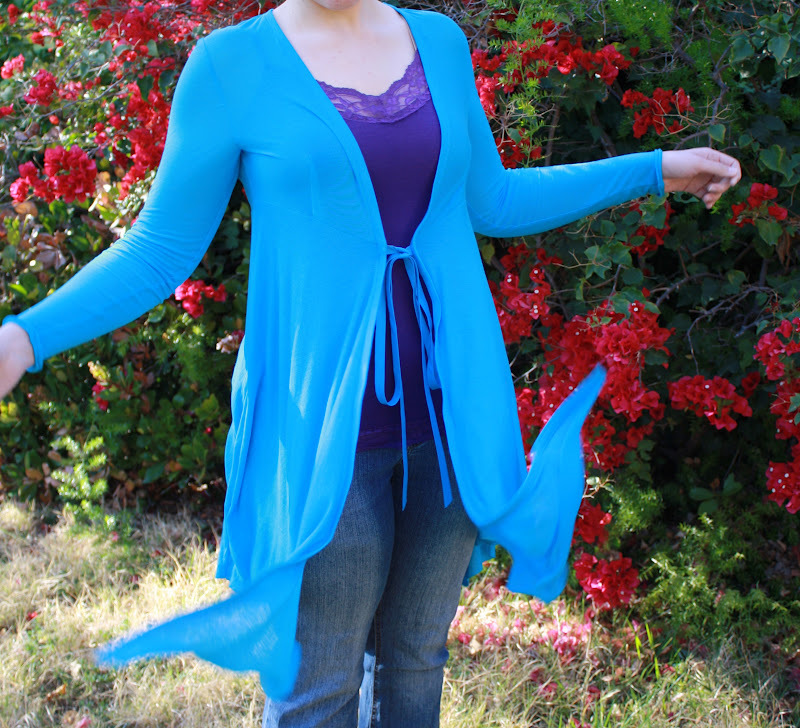 I am glad I saved it – this drapey cardigan was the perfect project for my beloved fabric! 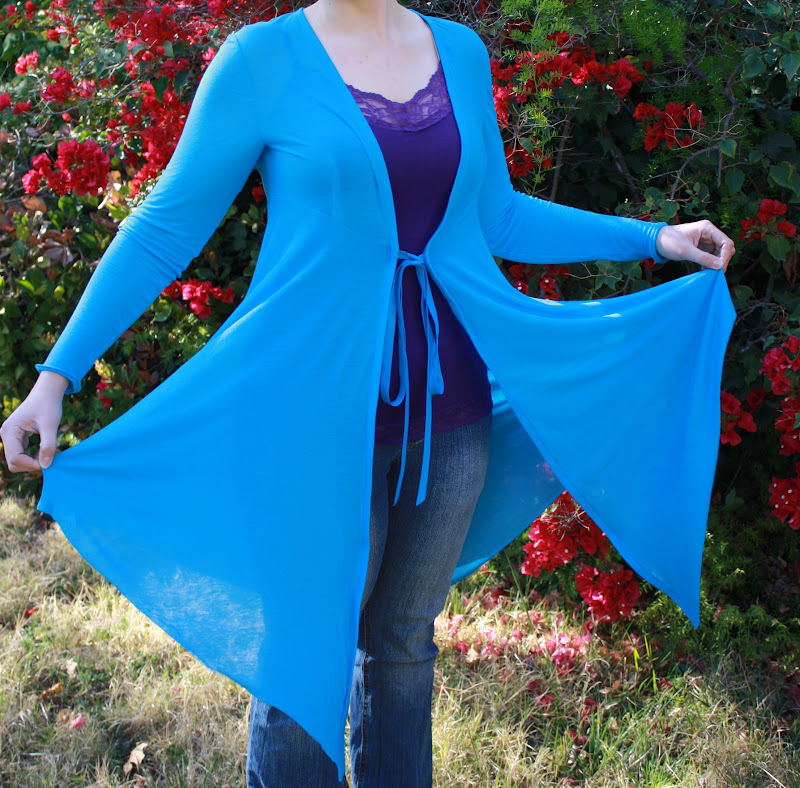 Pattern Description: Long sleeved cardigan top with front ties and draped skirt. Pattern Sizing: Burda sizes 36-44. I cut a size 40, grading out to a 42 on the lower back side seams. Were the instructions easy to follow? These instructions looked pretty good, though I didn’t follow them exactly. I had just made style 121(uses the same top pieces) so I decided to do things a bit differently. 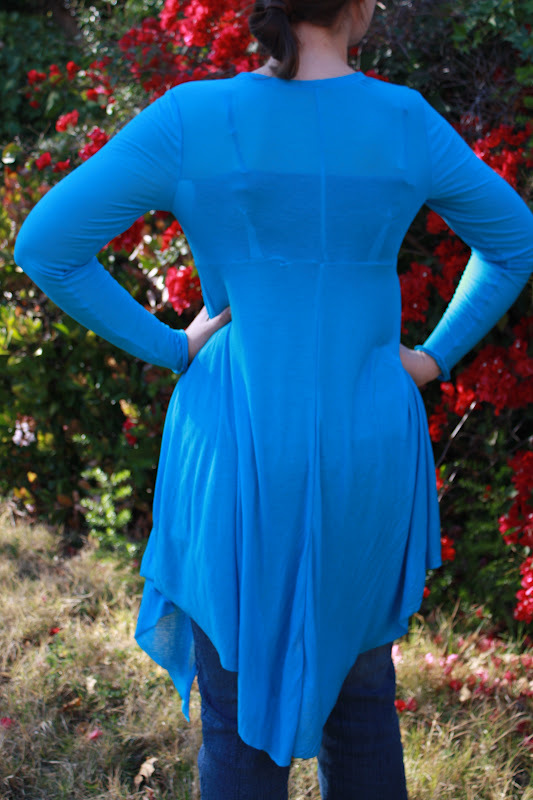 I used pre-packaged bias binding tape on the front and neck edges because this knit was super thin, and I didn’t think it would hold its shape well if I used the self-facing techniques recommended by Burda. In a more stable knit it might have been fine, but I had problems with the self-facing in style 121. The bias-tape gave a nice smooth well-finished edge. Also, I switched the construction order a bit – I left the side seams open, set the sleeves in flat, then sewed the sleeves and side as one continuous seam. This seemed to work very well, and on this thin, stretchy, shifty knit I am sure I got much better results with the sleeve insertion. Did it look like the photo/drawing when you were done with it? Yes! I think I used a larger bias tape for the front ties, but other than that it looked very much like the line drawing and photo. I am quite pleased with the results. What did you particularly like or dislike about the pattern? I loved the shape and style – very flattering and sort of romantic in a way. Love the darts for shaping and the center back seam can be helpful for fit issues as well. Very fast and easy to sew together. 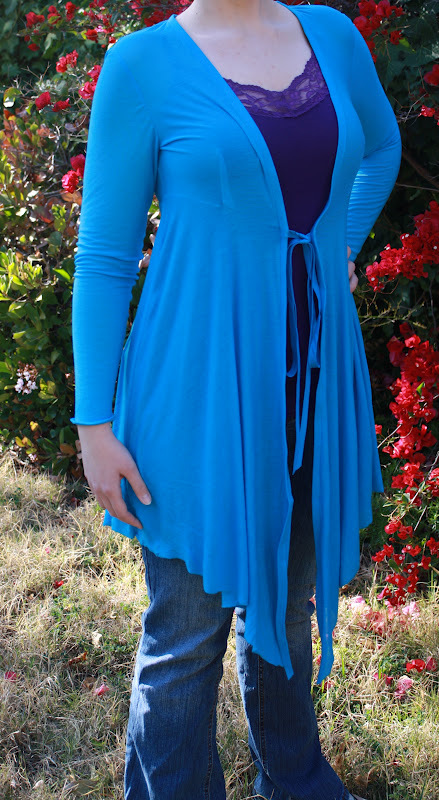 I love the drape on the lower part – it is just fun and cozy to wear. No dislikes. Fabric used: Very thin knit, possibly of rayon or cotton content. I also used 2 3-yard packaged of pre-made bias tape because I used the tape to finish the entire front edge of the top, as well as using it for the ties as instructed by Burda. Pattern alterations or design changes you made: Only real change is using the bias tape for the neck finishing. Also, changing the construction order, but otherwise I made it exactly as shown in the magazine. Would you sew it again? Would you recommend it to others? Well, this is a pretty distinctive top, so I don’t know that I need a lot of them. On the other hand, I do love it, so if the right knit came along, I would make another one. Especially in black or maybe a less vibrant color that would be better for coordinating with other clothes. I highly recommend this pattern to others. Conclusion: Love! I am so happy with this pattern – I am totally going to be living in this top – so great to just wear around the house, or out and about on a nice mild day. Perfect to wear over a dress, but also looks great over pants or a skirt. So happy with the results! I want one too! It looks great, just like the pictures. Hey – All these months later are you still happy with this cardi? I'm thinking of making one up soon. Yes, I still really like it! I haven't had much occasion to wear it lately (it has either been too hot or too cold – we are varying between extremes over here), but I still really like it. My fabric might have been a bit too thin/not stable enough to support the weight of the bottom part, but I don't really care because it is soft, cozy, and pretty. I want to make another one in black, but I haven't found fabric that is simultaneously stable enough and drapey enough yet.